Three Sons: Perry Owen, Kevin Owen and Scott Owen. 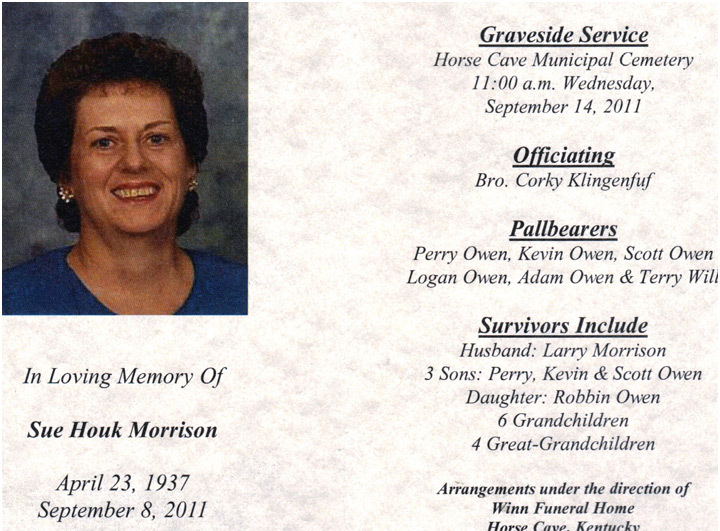 Graveside Funeral Services for Sue Houk Morrison will be held at 11:00 a.m. Wednesday at the Horse Cave Municipal Cemetery under direction of Winn Funeral Home of Horse Cave. Visitation at Winn Funeral Home after 10 a.m. Wednesday.Expressions of sympathy may be made in the form of donations to the American Heart Association.